Bay Turner (And Not a Penny More, not reviewed, etc.) returns for a third outing. Presqu’isle may be the most peaceful spot in the South Carolina Lowcountry, but it holds too many memories for former financial consultant Lydia Bayard Simpson Tanner, who retreats to her home on nearby Hilton Head to recover from the still-unsolved murder of her husband Rob. But trouble is always close at hand for Bay Tanner. This time her fifth half-cousin Mercer Mary Prescott, barely out of her teens, turns up in the Beaufort County jail on a vagrancy rap. The family patriarch, Judge Talbot Simpson, bails her out, but even his well-connected friend Lawton Merriweather can’t spring Mercer from a federal warrant stemming from trespass charges at the Savannah River nuclear site. When Mercer takes a powder, an assortment of thugs and goons follow in her wake, including Buddy Slade, her ex-con husband, and two of his groupies, Mags and Nilla, who beat Bay’s housekeeper Dolores Santiago within an inch of her life. Bay is also worried about her ex–sister-in-law Sarah, who’s lately taken to dumping her kids with her ex, Rob’s brother Red Tanner, to go on jaunts with Jack Wilson, her shady new boyfriend. Realizing that Hilton Head is no longer a safe haven, Bay sets out to find Mercer, visiting her aunt Eliza and Mercer’s foster parents, Bill and Vesta Scoggins. 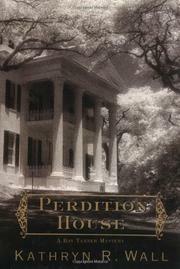 What she finds is the mystery of Perdition House, home to Lucy Spencer Robichoux, and the most deadly family secret of all. The finely spun plot makes Bay’s latest a taut, tasty chiller.